The Bukta made strip for the 1972/73 season was the second of United's tangerine kits, which had been introduced as the new home colours in 1969. The new look was a typical 1970s design, with the black high collar accompanied with a black V inset at the front. Having originally made an appearance a decade earlier, this collar design was re-introduced by Tommy Docherty's Aston Villa in 1969, and within a few years nearly every League club in England and Scotland had the same look. The tangerine shirt had black cuffs at the sleeves, and was worn along with tangerine shorts and tangerine socks. During the five years that it was worn, the kit went through a few minor changes. 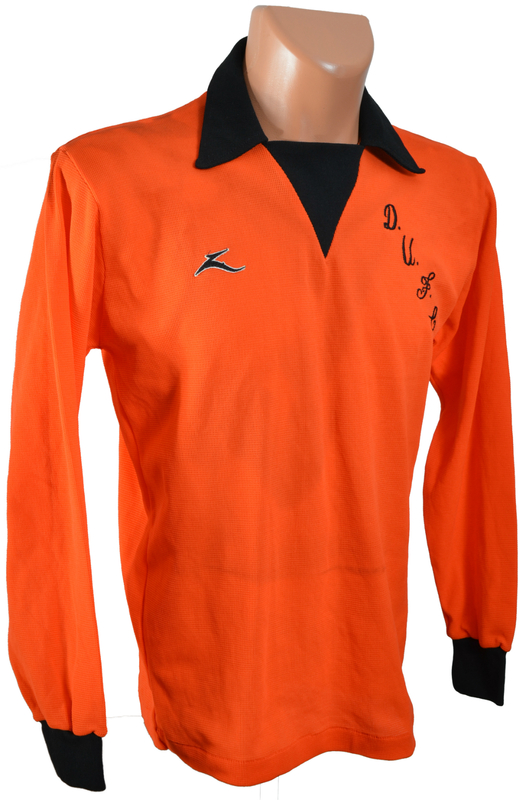 Originally a plain shirt, within a year a new Club motif was worn on the left breast, with the letters "D.U.F.C." in a fancy font embroidered diagonally in black lettering, which was worn for the first time in the 1974 Scottish Cup Final. Bukta's logo was added to the right breast in the 1974/75 season. The tangerine shorts originally had a thin black trim around the legs, but by 1973 the shorts had changed to plain tangerine, and later with a thick black stripe down each side, which also vanished in 1974. An alternative version of the kit was also introduced in 1973, with a thick black stripe down each side of the torso, as well as down the underarms towards the cuffs, but this was rarely worn. The kit was first worn in a League Cup sectional tie against Dunfermline at Tannadice in August 1972. Remembered mostly as the kit United worn in their run to the Club's first ever Scottish Cup Final appearance in May 1974, it was used in United's return to European football in 1974 & 1975, and was worn during the 1975/76 season which saw the introduction of the Scottish Premier Division. The kit is also remembered for the early years of Jim McLean's tenure as manager, and the pay off from his newly established youth system, with Dave Narey, John Holt, Andy Gray, Paul Sturrock and Graeme Payne all breaking into the first team.